Once Upon a Twilight! : Once Upon a Twilight turns 2 today! 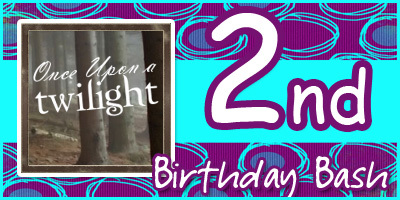 Once Upon a Twilight turns 2 today! Happy Blogoversary to Once Upon a Twilight today! I can't believe its been 2 years already. Feels like I just started the other day. OUaT has come a long way in my opinion. We have had so many great changes in the last 2 years. We went from being a blog about twilight adventures to an exclusive blog for book reviews. The COVEN has grown as well from just little old me to now having 8 of us in total. I honestly think I have a great group of reviewers and wouldn't change them for anything. Jenny, Trudy, Ana, Tammy, Monica, Deitre and Joshua all have their own uniqueness that help Once Upon a Twilight to shine. I'm grateful for you all every second of the day. There have been so many bloggers and authors that have helped this blog along the way. Thank you to each and everyone of you for trusting in us. As for our followers, I think or at least I hope you know how much I love each and everyone of you. Your comments and emails are what keep me going everyday. So as long as your happy we will be happy and keep it coming for you. To the authors we have worked with and created friendships with, I hope we have been able to aid you in your career and continue to aid you for the future. For those we have yet to work with, please contact us. We try are hardest to reply or read what we can. If we don't give you your chance then who will. To the publishing houses and publicity companies and everyone in between. Another huge Thank you to you all for all the support you provide us with. Here's to the future! (sniff, sniff) OK so pretty much all of you know that I lost my house to a fire this January. So that put a damper on the blogoversary idea I had. Which was I would give out a box of books to one winner. The box would had contained probably 20 books or more. Well a book drive was done for my birthday and I'm truly humbled with all the gifts I was showered with. Of course though, I couldn't think of giving out a huge box of the books I just had gotten. So when I ask my team, what should I do. They all came together and guess what? You know that box of books I was going to offer. Well how about a box of books from Jenny, Ana, Tammy, Deitre & Joshua and Trudy Plus I can even throw a small box of books too since I have a few duplicate copies. You see now why I say I have an awesome team. So I won't name every book up for offer in the boxes. Ill just tease you with a description of what might be in each box. Yara & Trudy's Texas Box: This box will contain signed books from a certain Pitch Dark Days tour and a few ARCs that seemed to be duplicated. Jenny's Florida Box 1: now this is the box with the WOW factor. There will be a mixture of YA and Adult and even a 1st season on DVD of a show. Ana's Florida Box 2: Ana likes to read a little of everything so of course her box will contain a little bit of everything too. Tammy's Wisconsin Box: Its a bouquet of YA books with a touch of audio. Deitre & Joshua's South Carolina Box: Fan of YA or Audio? Well this box might excite you when you get it. So this is our THANK YOU to you!!! We hope you continue to stick along for the ride. Please continue to share with us your comments and concerns. Until next year!!!! Happy reading!!! Happy BLogoversary! You guys rock! Thanks!! You guys are the one's that ROCK!! Thank you!!! WE love you too!! Happy Blogoversary!!! Thanks for the giveaway and cheers to another year! Thank you !! And CHEERS!!! Thanks for the giveaway and cheers to many more years to come! Happy Blogoversary and congratulations! Thank you so much for celebrating with us! Happy Blogoversary!! You all are amazing!!! Thanks for the extremely awesome giveaway! Thank you!! We are touched by your kind words and because of followers like you, it makes it all worth it!! Wow happy 2 year blogoversary!! That is awesome!! Keep up the good work, your blog is fabulous!! Congratulations and may more and more come!!!!!!!! I'm so glad I found your blog over a year ago and have stalked you ever since! One of my best founds on the internet EVER! I was so heartbroken when I found out about your home via Mundie Moms... T_T because I wanted to send you something ANYTHING but I couldn't afford it at the time...I think I'm getting a new job either April or May so I'm so going to stalk you then and send you even if only a little something because you're simply Awesome Yara...and not just you but your whole CREW!! Congrats all you guys! I love your reviews and posts and reviews again! You deserve every book every arc everything! Wish you all the best for this new year blogging and I'll make sure to continue stalking even more!!!!! Thank you !! Continue Stalking, WE LOVE Stalkers!! hahaha. Happy Blogoversary! I wish you many, many more. As you can see I have basically replied to everyone's comment but in case you've posted after this comment. I just wanted to thank everyone as well for everything. If it wasn't for all of you, the blot wouldn't be where it is today! Thanks for always commenting, and especially for following!! I want to wish everyone GOOD LUCK for the giveaway!! It's a great giveaway with a bunch of reading goodies that anyone will enjoy. Happy Blog Birthday and congratulations!! Congrats on 2 years, that is incredible! Happy Blogoversary!!! may you have many many more! and THANKS to all the girls for such awesome prizes!!! Congrats on two years! Thanks so much for the generous giveaway! Congrats and wishing you many more years to come! Congratulations on TWO years! I love how the coven stepped up to offer prizes. Congrats on the Blogoversary. I hope there are many more to come. Happy Blogoversary, sorry I'm late! I'm happy for you, and love your blog. Thanks for the chance to win a box o books! !